Magic Moment in the shop. Frequently the magic happens when you get two parts to mate effortlessly, or you save yourself from screwing up and breaking something. Other times it is when you look up and see an amazing sunset. 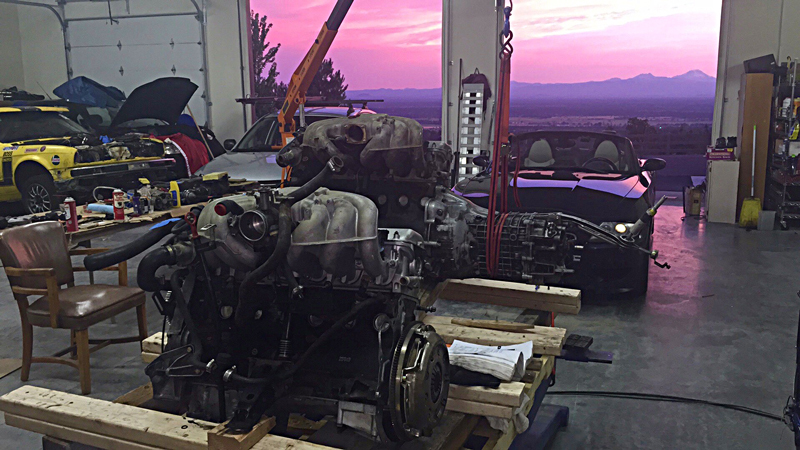 This happened last fall as I was swapping a gearbox between two engines, and the only camera I had handy was my cell phone. I looked up and snapped this pic. Ran inside the house to grab my “real camera” and the moment was gone. I really liked their ease of creating an online store for selling photographs, but they price-hiked their service into the stratosphere, and auto-locked me into their highest tier. Not exactly a great way to build customer loyalty. While I didn’t do much to promote it, the site always made enough to break-even for me every year when it was ~$150. But at $250 it just would not pencil out. Farewell! Here are some recent samples… snippets really, of my time-lapse noodling. Most are shots from my house, looking in some western direction, observing weather, sun rises and sets, some astronomical movement, and even some local fauna. One of these days I’ll have the bandwidth to edit these into something real. 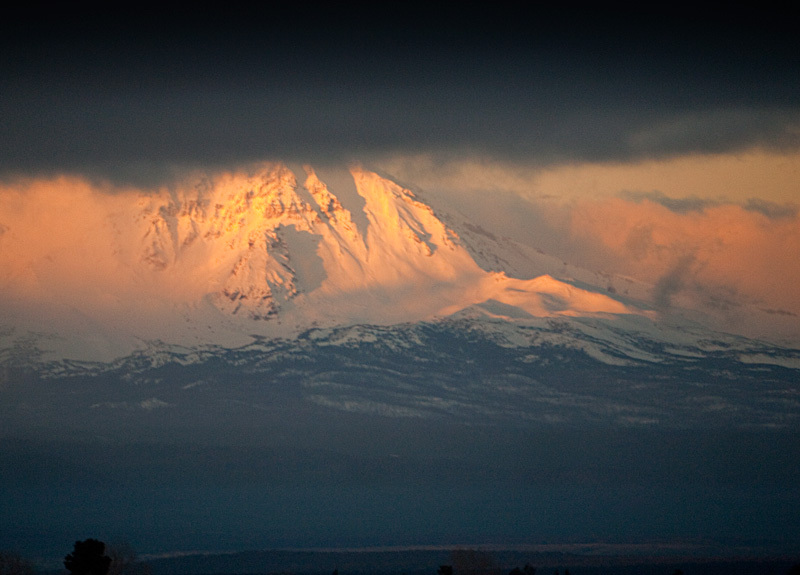 Until then, enjoy a slice of life in Central Oregon! Be sure to click the “HD” option if available, and go full-screen. I’m serving these off of Facebook rather than YouTube to spare you the ads. Please let me know if you have any issues viewing them. Hoping the embed code works. 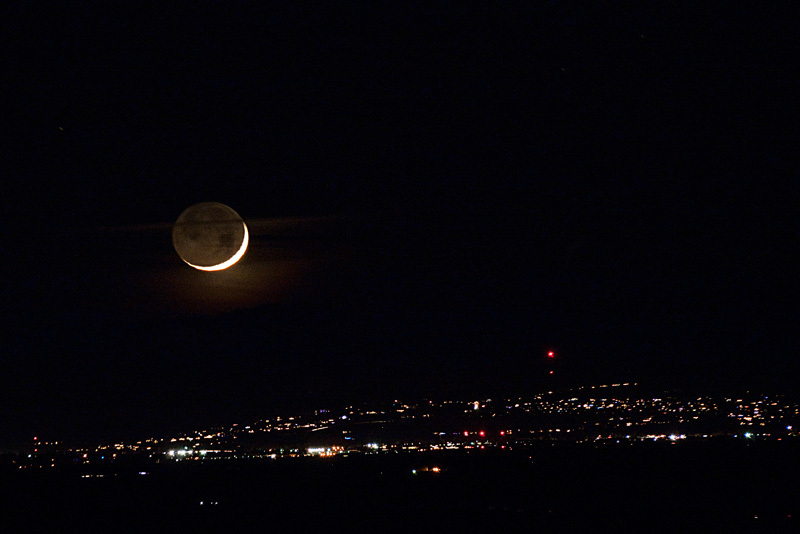 If you can, view it full-screen and HD to get the whacky atmospheric effects from the long (~600mm) lens. I shot this time lapse this morning out my living room window. I was able to predict the moonset path with an iPhone app, and then set up the tripod, camera, and intervalometer. After the moon set I did some low-tech panning and zooming…. yeah, not super-smooth, sorry. I will be the first to admit: 2012 was not a great year for my photography. I just wasn’t in a good frame of mind behind the camera. The images show it too. I had plenty of opportunity, I just did not execute very well. My 2013 photographic resolution will be to improve the technical quality of my shooting. 2012 was the first year in many that I didn’t take an extended road trip, and I think that had a lot to do with my “lack of focus”… if you’ll pardon the pun. All of my breaks from work were short-duration weekend things – none of which involved that road-time that unwinds and limbers up my creative mind. I planned a trip, but had to cancel it. Oh well. Three of my favorites from this year came from my participation in an insane race series for terrible cars (aka “crapcan racing”) called “The 24 Hours of Lemons“… The whole idea is to have as much fun, for the least amount of money – which if you know anything about motorsports, is a huge challenge in itself. I raced with two teams this year: My original LeMons team “Clowntown Roadshow” – made up of a great group of my Facebook co-workers. We have a beat-up old E30 BMW from ’89 or ’90 that we bought from another LeMons team (who, as legend has it bought it out of a storage locker for $1.) Despite looking like crap, it is actually a pretty nice little car. It handles very well, has damn good brakes, and if we could ever get our fuel, engine, and gearbox issues sorted out, AND keep the damn thing running for a whole race, we might actually finish in the top-ten. But, since we compete in the HIGHLY competitive west-coast series, I doubt we’ll ever be feared by the perennial leaders. * In motion, or expressing motion well. I have lots of shots which capture the essence of the chaos of LeMons racing, and nice portraits of my teammates and crew, but those have been shared before. 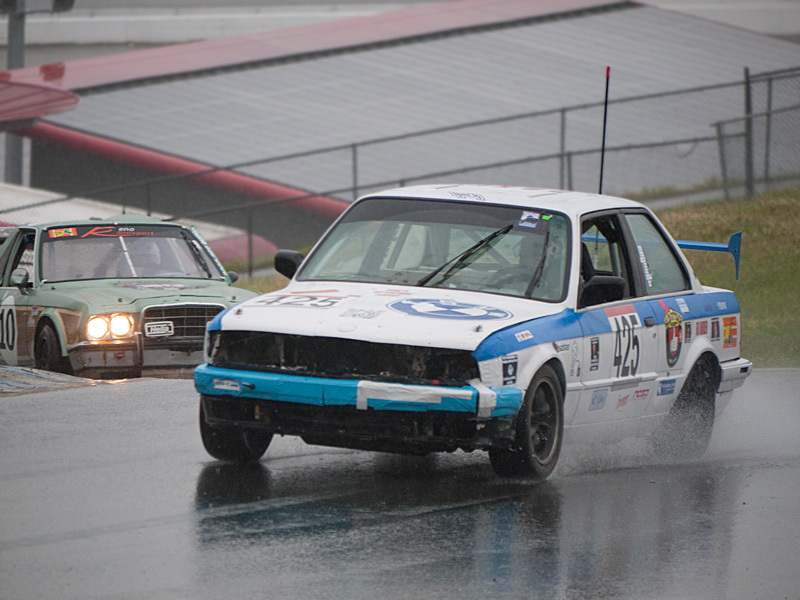 This shot shows just how soaking wet it was in March when we raced at Infineon/Sonoma Raceway/Sears Point/WhateverTheyCallItNow. Here my teammate Callahan Warlick tops the hill at Turn 2. The wet track and super-slick conditions lead to all sort of on- and off-track hilarity – including a wild fishtail on my shift down the far end of the dragstrip after Turn 6. From soaking wet Sonoma in Springtime, to hot, dry Buttonwillow (near Bakersfield) in Summer for a true twenty four hour race: The Arsesweatapalooza. As you can see our car has sprouted lights… which didn’t come on when the sun went down. It cost us a few hours fixing them. Sadly, my “golden hour” and night shots didn’t really come out well, but it was a blast to run all day and night. Very different experience. Can’t wait to do it again. 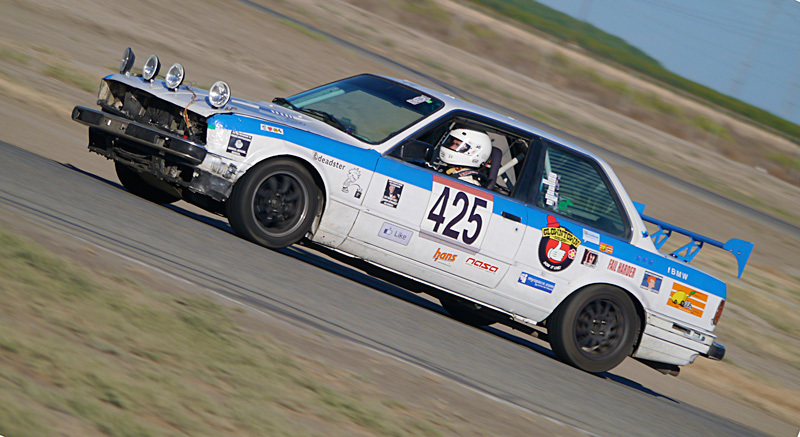 Here my teammate Donald Webster rounds Sunrise Corner at Buttonwillow. Part of the fun of crapcan racing is keeping a crapcan car running. 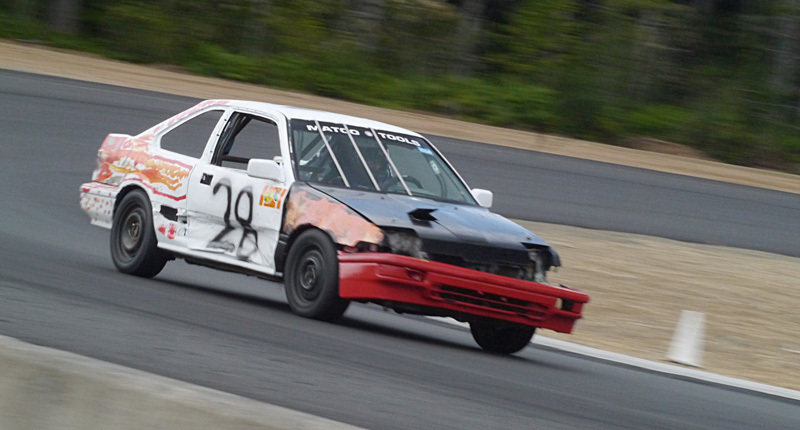 Above is the car of my other team, “Family Ties” – a Seattle-based group who ran their very first race in 2012. This car was being fixed in one way or another the entire time it seemed. See that flap in the hood? I made that. The purpose was to cool an overheating coil. Speaking of coils, this car also had several inches of spring cut out of its suspension between race days to fix a frightening tendency to wallow like a Manatee around corners. The track however, was so damn awesome that even wallowing around its corners was a blast. can’t wait to go back. So often with photography, a lot is about being in the right place, at the right time, WITH A CAMERA. This photo was shot just a few weeks ago… on my morning commute. I was driving east on Oregon Highway 126 when I caught sight of this in my rear-view mirror. I pulled off on a side road and pulled out my G1 with 100—300mm lens. I didn’t have a tripod, but instead steadied the lens on my rolled-down car window. I see alpenglow-illuminated peaks every morning, but the presence of the clouds is what really makes this shot special. 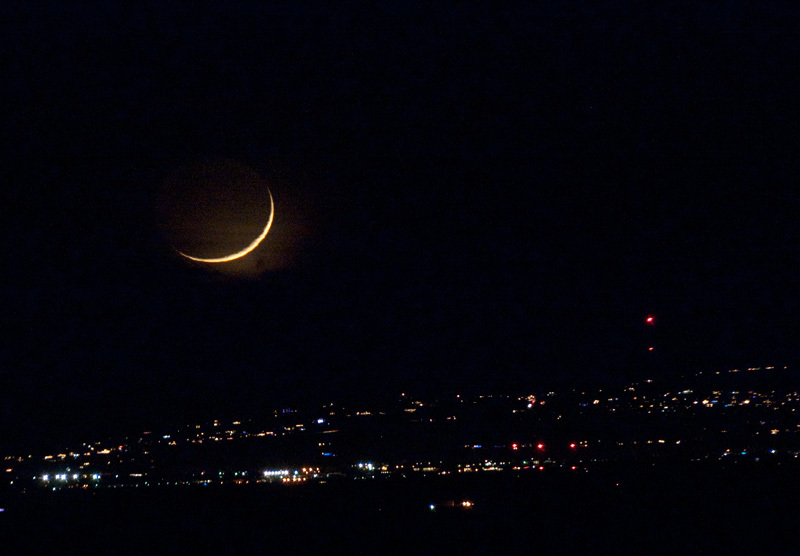 Not long after the alpenglow morning shot, I saw a new crescent moon as I was driving home one evening. Recognizing the moment, I sought out a vantage point as high up on the west side of Powell Butte as I could drive. Lacking a tripod, I set up my camera atop a fencepost and shot as the moon set above Awbrey Butte in faraway Bend, Oregon. The shots have a drama to them, but I’m not real happy with their exposure. It was always a compromise between the very bright crescent and the dim, though visible “dark side”. The other issue is proper shutter speed, as with such large magnification in a long lens the moon’s movement creates blurs with exposures more than 1/60th of a second. I was fiddling away with f-stops and shutter speeds trying to find the right balance, and of course as the moon set the light kept changing enough to keep me chasing perfection – and never quite catching it. Oh well. Finally, what is likely the best image I shot this year. 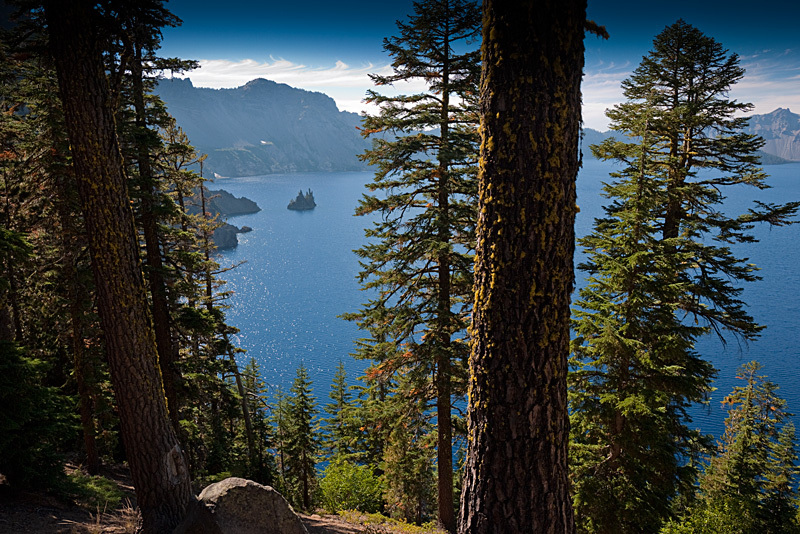 I visited Crater Lake – but at a time of day when the light did not make for great photos. This one is the exception, and to top it off, it was shot in an unusual manner. This was accomplished by mounting my ultra-wide angle lens equipped camera on the end of a long Monopod, and holding it up as high as I could reach using the fold-out screen (as tiny as it is when eight feet away!) to compose. Quite happy with the result though. I like the vibrance of the greens in the trees (both needles and moss) against the blues of the water and sky. It captures the magic of this amazing place in a very small way. Opening Day 2012-13 at Mt. Bachelor! 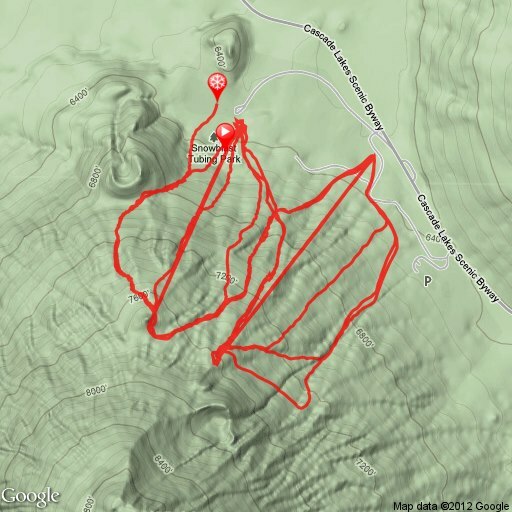 Thanksgiving was Opening Day of the 2012-13 ski season at my local “hill”, Mt. Bachelor. 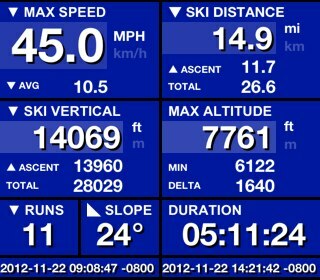 Nicholas is home for the 4 day holiday so he & I got up early and hit the slopes. We didn’t quite make first tracks, but we we’re the last of the first wave to get the good stuff. As a bonus, I strapped a small video camera to my pole, and later my boot, so you could follow along. I re-enabled my dormant Youtube account (which Google forced me into making it a Google+ account – and NO, I won’t be your friend on G+ – I have no intention of using it) to upload the video to share. Note that Youtube tried to auto-correct out the natural leaning that goes with skiing in order to “image stabilize” the movie. I find the result rather trippy. Enjoy! Author chuck goolsbeePosted on November 24, 2012 November 24, 2012 Categories life, Photography, Skiing3 Comments on Opening Day 2012-13 at Mt. Bachelor!